Tattoos don’t always have to be huge elaborate designs that take up an entire arm or chest. Subtle tattoo designs are becoming increasingly popular. Some benefits of subtle tattoos are that they are easy to hide with clothing and they are less likely to overwhelm your personality. Take a look at this guide to a few simple tattoo ideas for men and their meanings. This is a popular style of tattoo for men because they are aesthetically interesting and hold a lot of meaning. There are several specific Celtic knot designs, and each design has a unique meaning. For example, the Triquetra knot, or Trinity knot, is a symbol of protection. It also represents the elements of earth, water and air in Irish cultures. In pagan cultures, the Trinity knot represents the maiden, mother and crone. New age followers have also interpreted this knot as a symbol of mind, body and spirit. This style of tattoo is prefect for men who are descended from Celtic origins or who resonate with the rich meaning of a particular design. While many men get large and intricate Celtic designs tattooed on them, this style can also be simplified and sophisticated with clean lines and thoughtful placement. This is one of the most simple tattoos for men. A statement tattoo consists of a word or phrase without excess embellishment. Uplifting words or words that provoke deep thoughts are common choices for this type of tattoo. Some men also get an entire quote tattooed on them. These tattoos remind their wearers and observers of the important things in life. Another popular idea for a statement tattoo is meaningful lyrics from a song. Many men relate to music and have a favorite artist or band. Getting a tattoo of powerful song lyrics is a great way to express your personality and individual tastes. While astrology tattoos are commonly associated with women, they have their place in a man’s world, too. The glyph figures used to represent each sign in astrology are very simple. For example, the symbol for Taurus is a circle with the bottom half of another circle sitting right on top. It’s meant to look like the head of a bull with curved horns. This style of tattoo is easy to keep small and discreet, but it can also say a lot about you to people who see it. With the explosion of yoga and meditation practices in the Western world, more and more men are opening up to their spiritual side. As far simple tattoos for men go, this is simultaneously the most simple and the most complex. While the symbol itself is extremely simple with only a few lines, it has a rich meaning. This symbol represents the sound of “Om” which was the sound that initiated the creation of existence, according to Hindu and Buddhist teachings. It also represents the four states of the divine figure Brahman from these religions. These four states are kindness, compassion, joy and equanimity. Hinduism and Buddhism are two of the world’s major religions, and if you practice these teachings, getting an Om tattoo is a perfect way to represent your spiritual path. 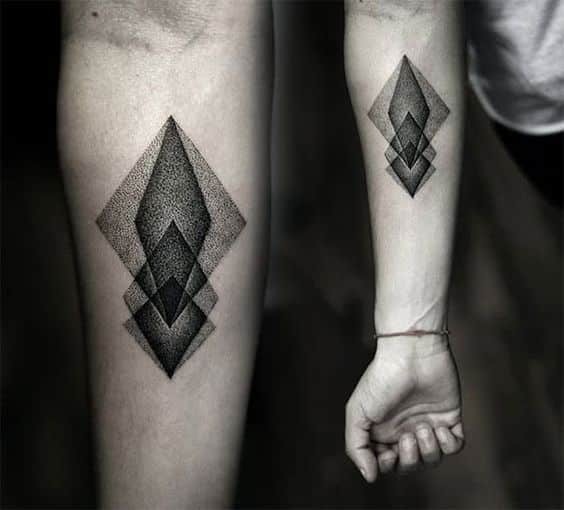 Tattoo around right forearm in black; this simple tattoo is two bands of solid black, each about a quarter inch thick, with a half an inch between them. The top of the upper band starts approximately two inches from the crook of the elbow. 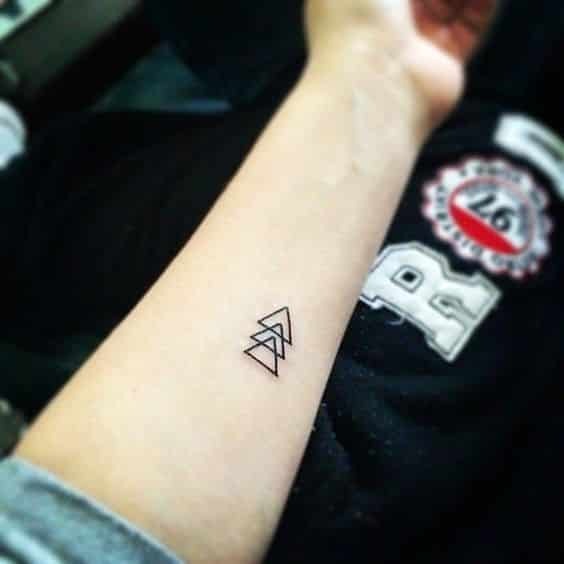 Tattoo on inner left forearm in black; tattoo shows the outline of three identical equilateral triangles, each about a half an inch long with the whole design a little over an inch long. 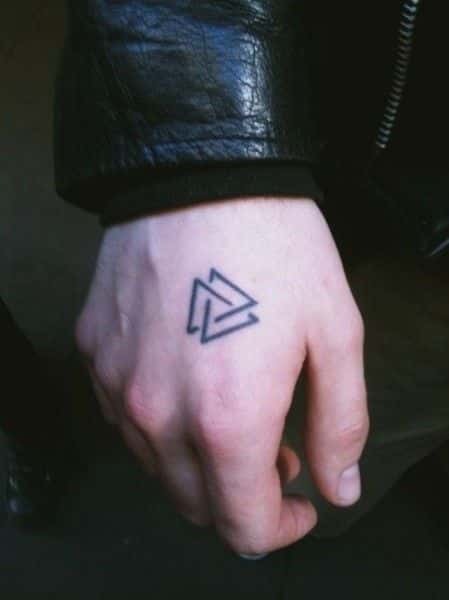 The triangles are in a line in the middle of the forearm, pointing towards the wrist, with the point of each triangle overlapping the back side of the one in front of it. Tattoo on the inner left forearm in black; tattoo shows simple runes or rune-like script in solid black lines close to the crook of the elbow. 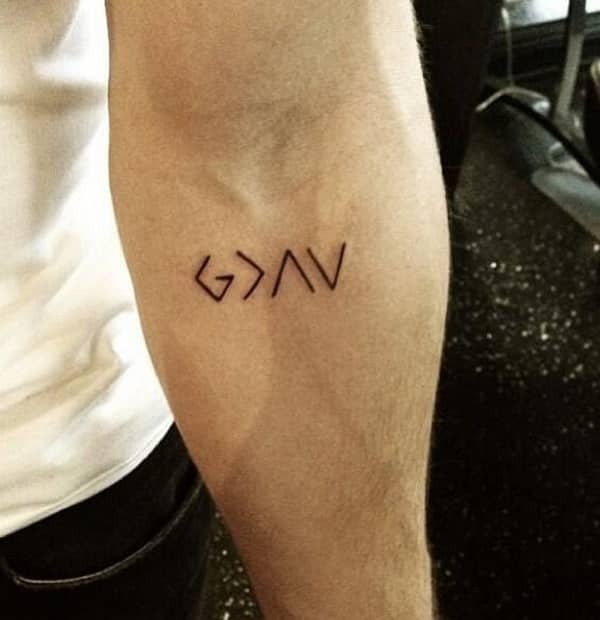 This tattoo is meant to be read correctly when the arm is down, with a character that looks like the letter “G,” followed by a left-pointing angle, followed by an upward-pointing angle, finished with a downward-pointing angle. 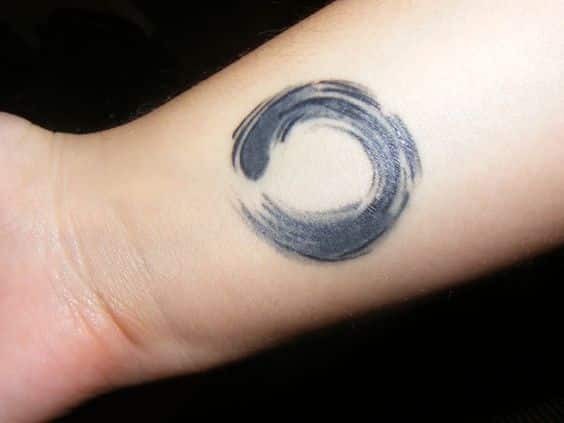 Tattoo on inner right wrist in black and gray; this is a circular swirl of soft gray accented by bolder black lines, about two inches across. The design mimics Japanese or Chinese ink paintings, with the different intensities of black ink in the tattoo showing the movement of the brush strokes. 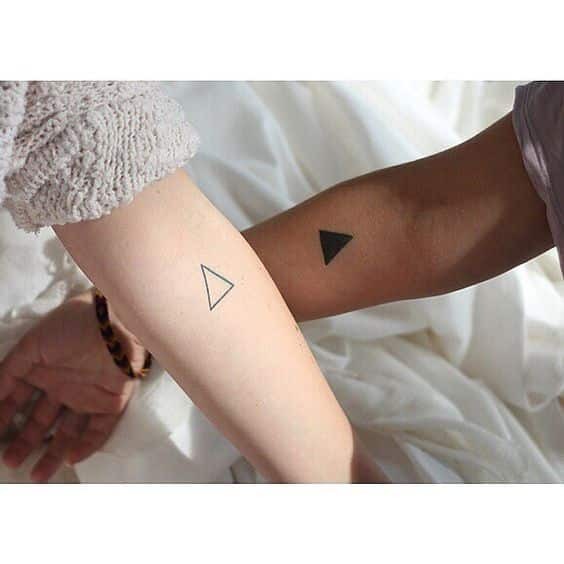 Matching tattoos on the inner right forearm of one person and the inner left of the other in black ink; this couples’ tattoo is one of the simple tattoo ideas that can elegantly replace tattoos of each other’s names. Both triangles ore the same size, about an inch tall, and both are in the same place, the inner forearm, about two inches below the elbow with the triangles pointing up towards the crook of the arm. His is solid black, hers is an open outline. Tattoo on right inner arm in dots of black ink; simple tattoos for men don’t always have to be small or outlines of geometric shapes, as this unusual design shows. Four diamonds made entirely of tiny dots of ink overlap on the upper forearm, creating shaded triangle and diamond shapes where the larger shapes overlay one another. 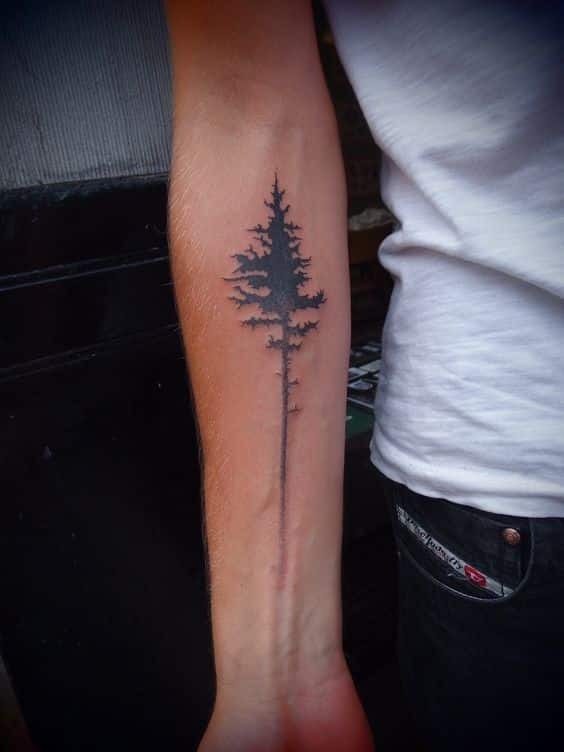 Tattoo on inner forearm in black; this simple tree tattoo is a stylized outline of the foliage of an evergreen tree with branches spreading near the elbow and the trunk a slash of ink reaching down to a few inches of the wrist. Not all simple tattoos have to be geometric shapes. Tattoo on top of right hand in black ink; this modern design on the top of the hand between the first knuckle of the index finger and the base of the thumb has ancient origins. The three interlocking triangle outlines form a “valknut,”a Norse symbol that dates back to at least the 7th century. 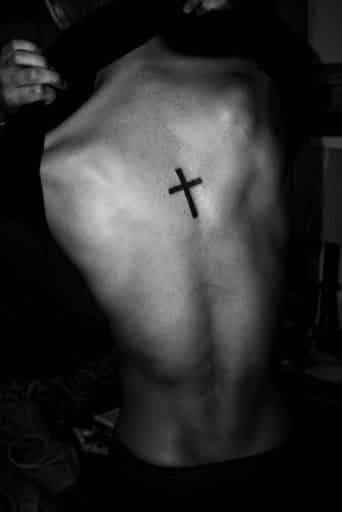 Tattoo on back between shoulder blades in black ink; this design shows a simple cross, about six inches from the base of the neck, made of two solid black lines, approximately three inches tall and two inches wide with no outlines or script. 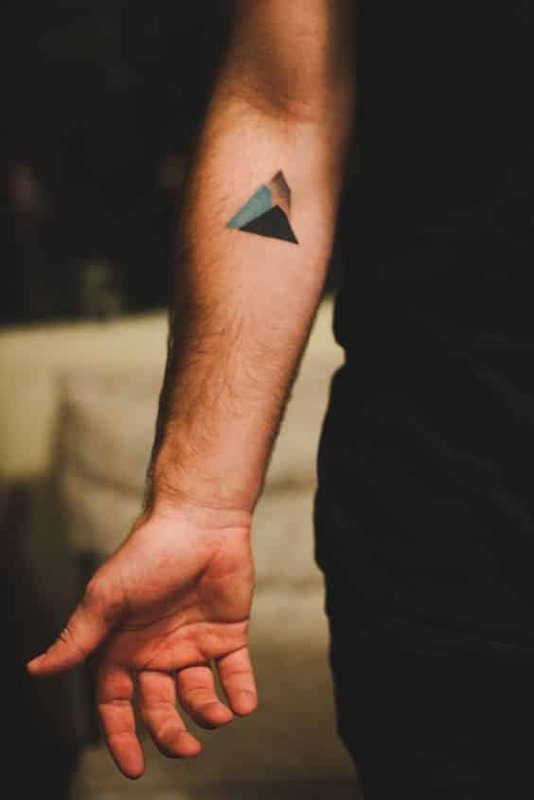 Tattoo on right inner forearm in blue, black, and gray ink; this abstract triangular mountain landscape is about two inches tall and two inches across. The mountain shapes overlap into a compact composition, with a solid black mountain in the front, a taller, solid turquoise mountain behind and to the left, and a misty gray peak above and behind the other two.